In April, Milliken & Company will begin building the largest clarifier plant in its history in Blacksburg, South Carolina. The plant is due to begin operations in 2020 and will boost capacity of Milliken’s Millad NX 8000 clarifier by approximately 50 per cent – a necessary expansion to meet the fast-growing global demand for this polypropylene additive that is helping users to realize significant sustainability and performance advantages. “Brand owners and packaging producers are clearly seeing how Millad NX 8000 can contribute to improved environmental and manufacturing results. It is one of the most successful products in the history of plastic additives, and arguably the most important in the past 30 years,” says Allen Jacoby, vice president for Milliken’s Plastic Additives business. The unprecedented global demand for the technology has prompted Milliken to expedite the construction of its new facility by two years, as demand for Millad NX 8000 is growing in every geographical region and across many end-use markets, with the strongest growth in Asia. 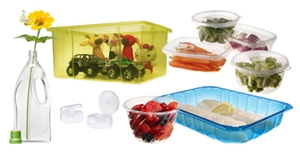 According to Zach Adams, global product line manager for Milliken’s Plastic Additives business, Millad NX 8000 offers many sustainability and performance advantages over previous polypropylene clarifier generations for plastic molders and brand owners who use it.